Soybeans, a staple of the Japanese and Asian diet for more than 5,000 years, contain plenty of protein and little fat, making them a healthy addition to your diet. They also may help prevent certain chronic diseases, such as high cholesterol, and they may protect against certain cancers, as well. However, soybeans contain chemicals called phytoestrogens, which are compounds from plants that behave like the female hormone estrogen in your body. Because of this, eating too many soybeans may raise your risk for some conditions. Soy appears as an ingredient in many processed foods, such as soy sauce and products containing soybean oil. However, these don't represent major sources of soy protein in the diet. Soybean oil, in particular, doesn't contain any protein. When you're looking to add soy to your diet, you'll normally turn to products such as tofu, tempeh, soy milk and soy protein powders. Some other processed foods, such as cookies and protein bars, also include soy protein. 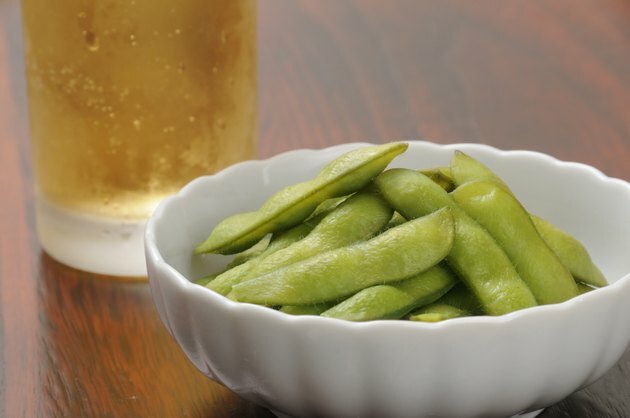 In addition, you can purchase frozen soybeans in the form of edamame and eat them in their natural form. Soy protein powder, in particular, contains plenty of phytoestrogens and may have bad effects on the body. In a 2007 study published by the medical journal "Cancer Epidemiology, Biomarkers and Prevention," 12 healthy men consumed two scoops -- 56 g -- of soy protein powder a day for 28 days. During the study, the men's level of the male hormone testosterone decreased by nearly 20 percent, while their levels of a particular female hormone rose. The researchers concluded that soy's effect on hormones requires more study. The phytoestrogens in soybeans may have anti-breast-cancer effects, and Japanese women -- who consume many soy products -- have lower breast cancer rates than American women. If you eat soy through childhood and adolescence into adulthood, you may dramatically reduce your risk of pre-menopausal breast cancer. However, it's not clear whether adding soy products to your diet after puberty can help you avoid cancer. In fact, there's some evidence that adding soy -- at least in the form of concentrated soy protein powder -- may possibly promote breast cancer cell growth. Again, researchers haven't answered all of the questions relating to soybeans' effects on your cancer risk. The jury's still out on whether soy works to protect you from disease or not. For example, consuming large quantities of soy protein -- more than 90 mg per day -- may also weaken your bones, and studies looking at soy's role in protecting against prostate cancer haven't yielded any firm answers. If you want to add soy to your diet, consider sticking with edamame, low-fat tofu or tempeh, and limit yourself to two to four servings per week. You're unlikely to derive health benefits from eating more soy than that each week, and consuming large quantities of soy phytoestrogens may actually harm your health.